Candles are manufactured by myself. I make them of organic soy wax and seashells. Light this candle before Lomi Lomi session and invoke your intention for the massage. You can also buy sets to enjoy them at home or give them as a gift to your loved one. Large tealight candles made from an all natural soy wax blend. Comes in a gift box as pictured. Made from organic wax to provide the best burn time. 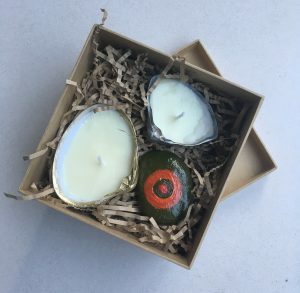 Each gift box contains 4, 3, 2 or 1 candle. You can buy it here.